This is a follow up post to Wireshark and MongoDB 3.6, in which I explained how I added support for MongoDB's OP_MSG and OP_COMPRESSED message formats to Wireshark. 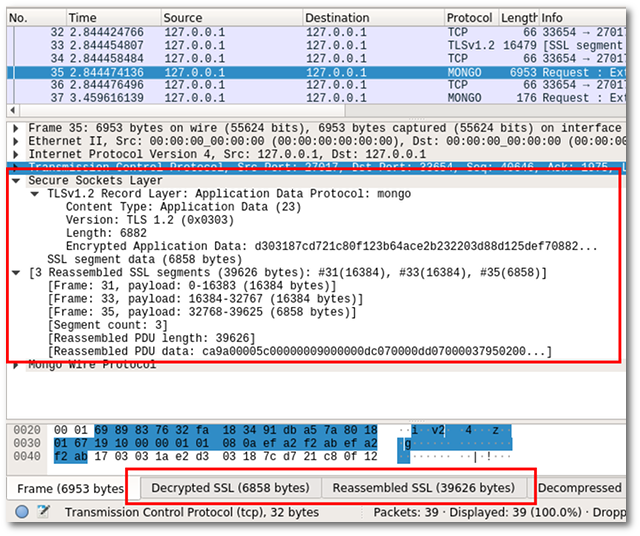 In the conclusion of that first article, I alluded to the complications with inspecting SSL traffic in Wireshark, which I hope to cover in this post. 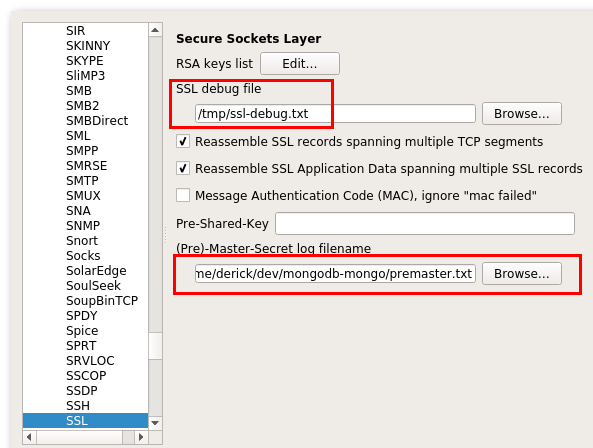 It is common to enable SSL when talking to MongoDB, especially if the server communicates over a public network. When a connection is encrypted with SSL, it is impossible to dissect the MongoDB Wire Protocol data that is exchanged between client and server—unless a trick is employed to first decrypt that data. Fortunately, Wireshark allows dissection and analysis of encrypted connections in two different ways. Firstly, you can configure Wireshark with the private keys used to encrypt the connection, and secondly, you can provide Wireshark with pre-master keys obtained from a client process that uses OpenSSL. When you start using Wireshark with SSL encryption, it is also wise to configure an SSL debug file in the same screen. I have set it here to /tmp/ssl-debug.txt. and cannot be decrypted using a RSA private key file. After some searching, I found out that if the session uses Diffie-Hellman for key exchange, Wireshark can not use the RSA private key, and needs different information. On an earlier run, I must have used a different version of either the encryption library (OpenSSL) or MongoDB, which did not use Diffie-Hellman. This brings me to the second way of providing Wireshark with the information it needs to decrypt SSL encrypted connections: the pre-master key. This key is created during the connection set-up, and therefore you need to read data structures from within the OpenSSL library. You can do that manually with GDB, but it is also possible to inject a special library that hooks into OpenSSL symbols to read the data for you, and store them in a file with a format that Wireshark understands. You can find the source code for the library here. The OpenSSL LD_PRELOAD trick should also work with the PHP driver for MongoDB as long as it uses OpenSSL. You can verify which SSL library the PHP driver uses by looking at phpinfo() output. For Java programs, there is an agent you can use instead. This patch, and the two patches mentioned in the previous post, have been merged into Wireshark's master branch and will be included in the upcoming 2.6 release. Until that is released, you will have to compile Wireshark yourself, or use a nightly build.